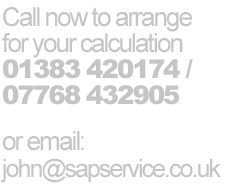 The SAP Service is proud to offer the BEST SAP DER/TER Calculation rate on the WEB of just £35.00 for a repeated dwelling or flat! No other established rating service offers such a deal! With over 10 years experience, the SAP Service is fully equipped to receive drawings via AutoCAD, MiniCAD and PDF, and of course by post. After receiving your drawings we will advise the most effective route to pass. This involves specifications for floors, walls, roofs, windows and doors, heating systems, and an assumed air pressure test value. We will also produce Energy Performance Certificates for inclusion in Home Information Packs when they are required for new housing from April 2008.